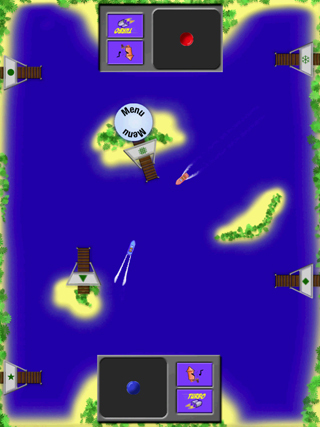 Description: A simple 2 player game where you can control 2 boats in your own private virtual pond. Just boat around, or play a Taxi game, or race eachother in a racetrack you can design! Description: To help people navigate the company website, we created a virtual assistant called Sally Whatnot. My work: Creating the interactive videoplayer (as3.0), Video editing and After effects, puppeteering and voice acting. Created at: Bau & Stee O.M.G. Just updated my WordPress install, now I have a better looking portfolio page. I also updated my bio page, so go check it out! Description: A fast paced racing game. Players of this game where eligible to win a flight in a real jet fighter. Written in Actionscript 2, I optimised the game engine as much as possible to keep the framerate high. The game would also automatically decrease its quality if a slow computer/low framerate was detected. Description: A “Sjoelen” (a Dutch kind of Shuffleboard) game with physics, where “Kanis & Gunnink”,the 2 stars of the Television commercials, give comments while you’re playing. Trivia: Thats my hand you see in the game. Description: In this game the player is a a club-patron trying to pick up girls or guys. (depending on your preference) But unfortunately you have very bad breath. The player needs to pick up tubes of Prodent Arctic Whitener Toothpaste or Spheres to get rid of his bad breath before trying to get a date.